In the back of my mind is a friend’s comment some weeks back that fried tampalen is deadly delicious and often added to lumpiang ubod or pancit for that combination of fattiness and meatiness, if that makes sense. But I have never come across tampalen before, let alone cooked it. And googling it yields almost no entries whatsoever that are helpful. So I need your help… What exactly is pork tampalen? From what part of the pig does it come from? Does it have an English name or term that refers to the same part of the pig? And how is it most often used in cooking? As I type this, I am experimenting by rendering small chunks of tampalen in a wok over low heat. I figure I can make lard out of it, but I am hoping that the cooked solids are good for something else… If you can shed any light on this fatty mystery, I would appreciate your help. Thanks! Here, the rendered pieces of fat, spongy and slightly chewy, not totally crisp and lightly golden. I went to the butcher last christmas looking for caul fat for the chicken relleno I was making. He pointed to a pile of fat (that looked exactly like your tampalen) and I said,”no, not that. It’s fat that looks like a web” The butcher insisted that that was it. I said it’s used to make gallantine. Again, he insisted that that was it. I bought $6 worth of a big pile and I thought it was cheap anyway so I could take the risk. When I got home, the fat would not expand like caul fat. So I tried rendering the whole thing and what I ended up with was a wok-ful of fat which when cooled became very hard lard, so hard it stuck to the plastic bucket it was in. Can you imagine that thing sitting in your arteries?? proper term i believe is “backfat”. this is pork fat that does not melt as easily as tampalen. the back fat normally comes from the fat under the skin of a pork chop. used for longaniza, morcon etc. our palengke butchers normally know of tampalen but i can no longer remember from what part it comes from. i believe that’s impilla…aky your lechoneros about it…we used this to render fat…and we deep fry our empanada in this fat….the solid remains we top it in our palabok…. I’m your avid fan always reading your blog! share lang po , i’m using tampalen as my pang mantika sa pinangat na sapsap . I usually put this at bottom of the pan then the sapsap w/ salt and some seasoning w/ bit of water. Cover the pan until the lard will fry the sapsap. What’s funny is when you google tampalen, the first article is YOURS. That’s not helpful, is it ? This could be leaf lard. From wikipedia, “the highest grade of lard, known as leaf lard, is obtained from the “flare” visceral fat deposit surrounding the kidneys and inside the loin”. My mum chopped these into small cubes and rendered the fat out. The solid bits that are left from the rendering she used to sprinkle over her pancit luglug in place of chicharon. 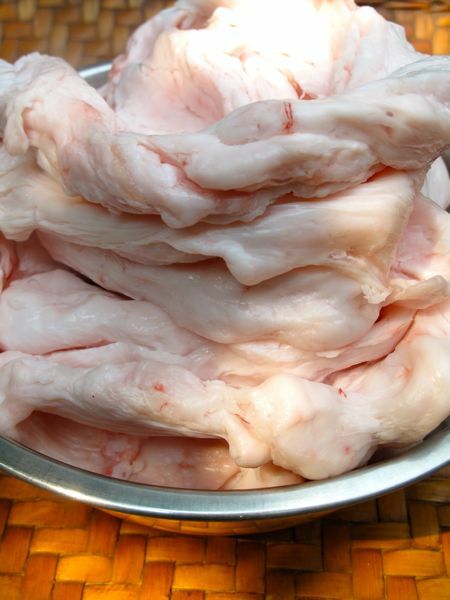 Tampalin is the soft belly fat and is mainly used to make lard. Backfat is the hard fat and the one used for longganisa. Re Ken’s comment, I wonder if most commercial empanadas are also fried in pork fat? Deadly! Oh my lola told me once that Max’s Fried Chicken tastes very malinamnam because it is fried in pork fat. I don’t know her basis for that but she probably could just tell from the taste. @Peach a lot of fried food taste better when fried in lard. I remember my aunt buying that type of fat to make the oil she uses for frying cooked embutido during fiestas. She also dips it in batter and fries it for pulutan. A quick check suggests that tampalen is the more tender fat usually covering the tenderloin towards the spinal area. Its supposed to have that melt in your mouth quality that the sturdier pork backfat lacks. So sizing may have a role to play when you ratio the meat to fat. Hope that helps ! cheers ! Just looking at the pictures raised my cholesterol levels!!!urghhh!!! The fried pieces resemble what I see sprinkled on top of Pancit palabok. From your description it sounds like sinew. I attended a sausage making class from a Frenchman. He advised against using sinew. So if it is, I wouldn’t use it. i attempted making skinless sausages before and just used the fat near the skin, the really solid one, even on on pigue cuts or porkchops. it doesn’t melt or disappear in the meat, so you’re left with wet (meaning fatty) sausages. We own a meatshop and my husband has had some experience helping our butchers. He said it’s impilla (we call it “bintak” here in Bicol). Once the pig’s cut in half lengthwise, that can be found attached to the ribs all the way down to the belly part and is pulled usually just by hand to separate it from there. Backfat, on the other hand, can be found at, well, the back part of the pig’s body from the nape part where it is at its thickest up to where the spine ends. You can find it in pork chops. Hope this helps. I could be wrong but without googling and if my memory serves me right, it’s called leaf lard…different from caul fat. CWID: in the spring or summer. go on Craigslist…farm and garden category. There are local farmers who raise pigs. Contact them and ask for the sensal or caul fat. It is called lace fat as well. If you want to make longganisa, I have quite a bit of frozen sausage casing I bought last year from a sausage making company in Aldegrove. You can have them…patikim na lang ng gagawin mong longganisa! hi mm! is that the “empilya”? Thanks for your tips. betty. 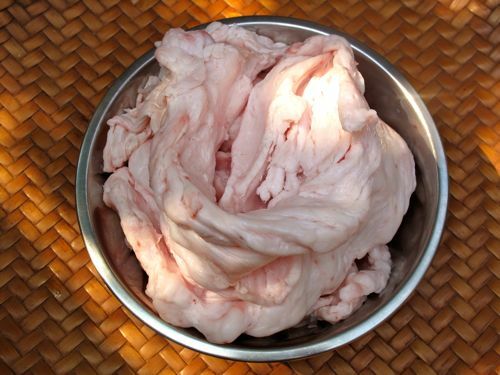 The first time I looked for sinsal, I asked the butcher for leaf lard and he got me fat instead, until he figured it out and he said it was called caul fat. I think that even butchers don’t recognize sinsal so easily. There is sausage casing available from the chinese butcher on Park Road in Richmond. I bought some a few years back and was surprised how a samll bundle can be so much! Agree with those who say its visceral fat or omentum…by the way, humans’ have this too and too much causes insulin resistance, heart disease etc. Not good. Omentum – that web of tissue and fat that surrounds our abdominal organs loosely. Not a pretty sight to behold in a dissected human but full of possibilities when seen in a pig. I think some meat dishes even call for this to be wrapped around a piece of meat for roasting… to keep it moist. hi..with regards to tampalen, it is found in the pork belly(liempo), and porkchop, it is where the kidney or what they usually called bato was attached, im familiar with this one coz my family is in meat selling in the phils, the back fat that you were looking for, is the one attached at the side of the pork shoulder(kasim) and youre right, thats one of the main ingredient of longganisa. 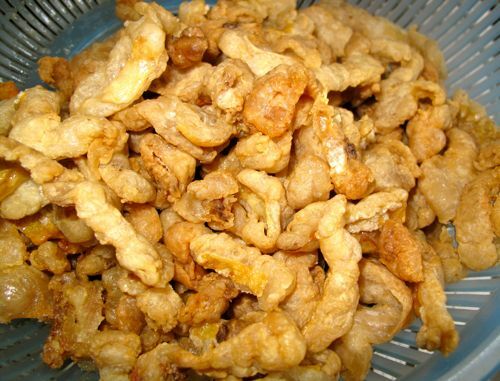 MM, it;s fat from the stomach, which holds the digestive tract, intestines, etc… they add that on top of pancit luglug .yummy!! korek!!! it’s part of the greater omentum and lesser omentum, which holds intestines and stomach . aside from using it as crispy toppings on pancit luglug, some add this with their sinaing na tulingan. i tried it, in Batangas it was placed in the bottom of the palayok together with dried kamatis and luya. the tulinagan are laid on top of it. after simmering for hours, with little sauce. this fat and kamtis mix add patis , WOW!!!! yummy sawsawan for your tulingan. @rosedmd..ay tama po masarap nga yan ang tawag namin jan pag bibilhin sa butcher eh bintak, pwede kang bumili ng 10pesos lang. Sinasangkutsa para sa pancit habhab. Hi MM! i’ve been using leaf lard in making torta ever since. you dont have to refrigerate it, it doesnt spoil. I’m scratching my belly and it feels like I have a forest’s worth of leaf lard in me. sir, tampalen is different from backfat. backfat is kinda tough while tampalen is soft to touch. 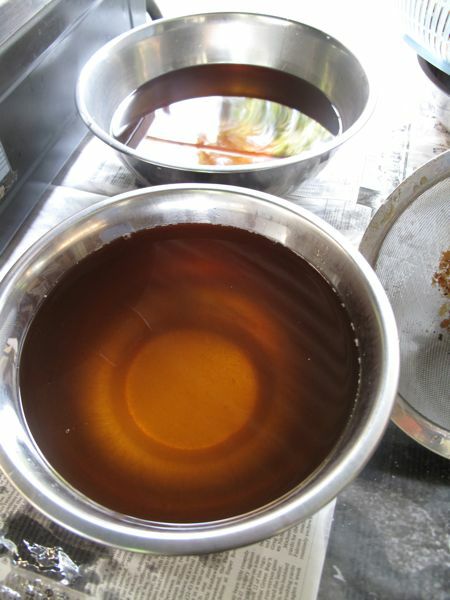 it is also more expensive than backfat that is why it is not used for meat processing, rather it is used as a flavor enhancer for pancit like chicken oil. in our plant, we make our own chicken longaniza and instead of using 3/4 kilo of meat and 1/4 kilo of backfat, we use 1 kilo of meat and 2 tbsp of cooking oil/evoo as binding agent because it won’t stand without it. In our palengke butcher shop, we NEVER use tampalen/impella for longganisa. This is because this type of fat (which is found in the belly and around the kidneys) easily melts. Thus, the longganisa gets major shrinkage and greasiness when cooked! We use backfat (the Americans call it “fatback” naman) or fat from the nape (batok) because it doesn’t disintegrate and has a nice chewiness to it. Here in Italy, the butchers use lardo (backfat) and guanciale (cheek and nape fat) for their cured salame for the same reason. Also, I think your butcher is overcharging you, because tampalen costs just around 80 to 100 pesos per kilo at our store. It’s the least desired type of fat because it can only be used as cooking oil. Backfat is more expensive at around 120 pesos per kilo because it can be transformed into other products like chicharon. So, ask for a BIG discount next time! I hope this is not late. But what I remember about tampalen is that it’s the fatty layer covering the pig innards when you open it up for butchering. It is called tampalen because butchers usually slaps this part to lossen it up before they get the innards. Maybe there is a connection between tampal and sampal. So that is what I know. Hehe. Isn’t this what some people use to wrap morcon in? Like that famous restaurant? Hi MM, I think you need to keep it a little longer on the stove. When I need to, I usually buy 1 Kilo, cut it in large cubes and put it in a pan with a little salt. I render until crunchy and almost dried up. This crucnhy bits are topped over pancit. But it really is just delicious as “pam-papak”. Yes, it is definitely empilla. A well known bakery (maybe 50 years in business) in our town uses its lard in making their ensaymada. I guarantee you, their ensaymada is the best I have ever eaten in my life. Tampalen is lard fat. IÂ´ve worked in the meat industry before and the best fat used for longanisa is backfat, the fat which is attached to the loin/lomo. it looks like what my mom puts in our guinamos (the dry version of bagoong here in negros). she boils it in water and fry it in its own oil with chopped. it’s fished out when it’s spongy and lightly golden brown. she refers to it as tulapo. the guinamos, which has been soked in vinegar, is then sauteed it with more chopped garlic… then adds the tulapo at the last stage of cooking. bob’s in bacolod sells tulapo in small pockets. 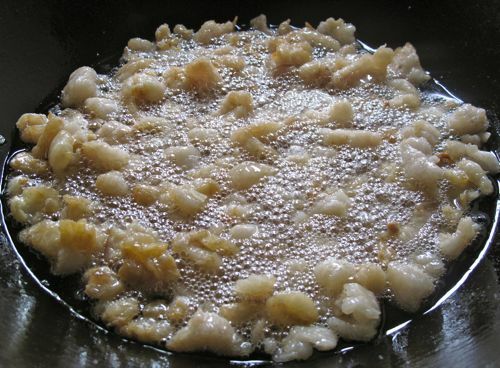 Leaf Lardâ€”Is the pure fat of the hog which surrounds the kidneys and is usually put up in cone shape and flat pieces. Caul Fat or Hog Caulsâ€”Is the fat covering the intestines. web-like fat in tagalog is panyo-panyuan,this is use to wrap the stuff shrimp (diok-bit-he) in chinese (fookien dialect). it is always nice to learn new things from here. :) i wonder if this would also be good if used to make crispy pata. Sorry I’m confused. So the fat that MM got was really Tampalen?